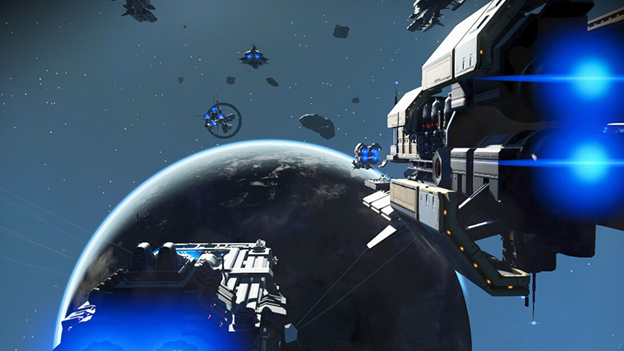 NO MAN’S SKY NEXT is the product of years of incremental updates following the launch of 2016’s oft-maligned space simulator. For many, the long-awaited addition of a fully functioning multiplayer component is the main draw of the overhaul. The marketing for this update would certainly like you to believe that. Yet NEXT’s main focus revolves around purifying and magnifying the core elements of NO MAN’S SKY, and to understand the core of the game and the spectrum of responses it has garnered from fans, newcomers, and skeptics alike, you first need to understand a story about eggs. I first experienced the eggs in question through a dramatic Twitter thread recounting an experience a player and his friends shared ingame: landing on a barren planet, discovering an abandoned planetary outpost, and finding a pile of eggs sitting outside. “Whispering Eggs” are large, bumpy, and clustered in small groupings, as if glued together by some kind of alien slime. They appear from a distance in the game’s analysis visor, implying they are of monetary or narrative importance. 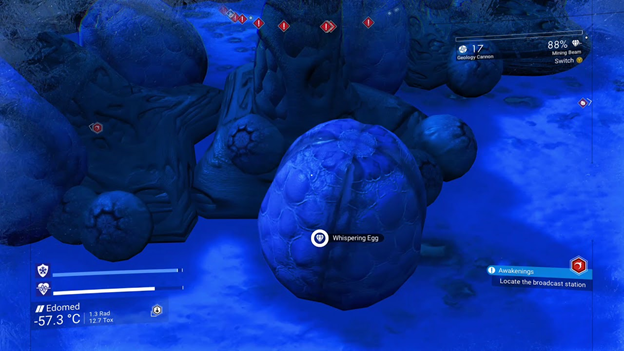 The twist of the Twitter thread is that when the eggs are mined (NO MAN’S SKY is very encouraging of a “mine first, ask question later” type attitude), they not only drop a glowing object called a “Larval Core,” but also summon something the game and its high-tech Analysis Visor can only describe as a “Biological Horror.” The beetle-like Horrors quickly attack the player and his friends as they flee to their ships, Larval Cores in hand. The explorers are nearly killed, as the horrors are more dangerous than anything else in the game so far, but they escape, just barely. The Cores net a huge amount of credits when sold on the Galactic Market, easily making the battle with mysterious beetles a worthwhile risk. This whole scenario is new to NO MAN’S SKY, the multiplayer, shared-experience element especially. From here, the story spread like wildfire, with other players finding Whispering Eggs and the much more tame and far more elusive “Humming Eggs” (housing another valuable resource called Albumen Pearls) in underground caves. The idea is thrilling. For all the mystery that NO MAN’S SKY’s large, procedurally-generated world promises, a true surprise is authored content that can be experienced with friends. A little story made just for you, cast in a sea of familiar randomness. The magic diminishes somewhat in the epilogue: it didn’t take players long to figure out the most efficient ways to find and harvest Whispering Eggs and calculate just how much money you could make selling them. This is NO MAN’S SKY in a nutshell, even after its much hyped and lauded NEXT update. No matter how many additional layers the developers heap on, the skeleton remains the same. Grinding is still the game here, but now there are even more ways to play the system. NO MAN’S SKY is a survival game. Its focus is managing meters, collecting resources, and chasing upgrades, all in the hopes that all of the previous tasks become easier. It’s also an exploration game. NO MAN’S SKY takes place in a vast, procedurally-generated universe of solar systems, planets, and the variety of flora and fauna that populate them. It sets you on a broad but meditative story of how the universe and the various alien races vying for control of it came to be. You’re alone in this quest. You can command fleets, build towns, and hire aliens to run them, but it is fundamentally a lonely existence. You fly alone, you learn alone, and you explore alone. You tell your own stories and—critical to the tale of the Whispering Eggs and the broader reception of NO MAN’S SKY as a whole—you use your own imagination to tie these systems, visuals, and broader suggestions of narrative together. This remains true in NEXT, even if you can now have three other people along for the ride. This is because NO MAN’S SKY is MINECRAFT. It’s immediately more complicated and a lot larger, but it depends on the same basic skills from its players: curiosity and a willingness to roleplay. MINECRAFT was developed in public (jumpstarting the quickly souring “Alpha/Beta/Early Access” nomenclature that’s now popular on all platforms), and consequently a big part of the fun was tinkering with the changes when a new update came out: finding new recipes for items, seeing new terrain or creatures that had been generated, or coping with new systems that needed to be managed. Like NO MAN’S SKY, MINECRAFT feels the best with other people coexisting in the same world. 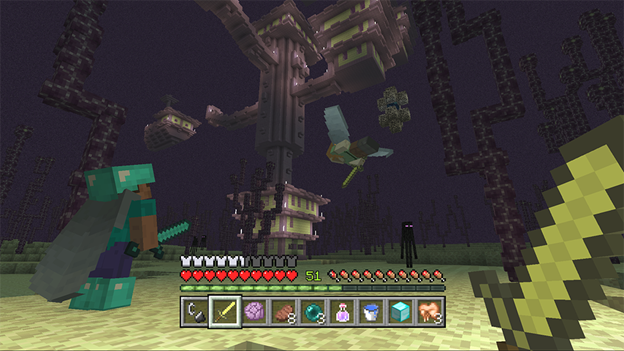 Sure, MINECRAFT received a rudimentary story with its final update before being “released,” but it always depended on players’ ability to set their own goals and tell their own stories about what they were doing and why. Using this mindset to frame NO MAN’S SKY, it’s easy to see how things got out of hand following its initial release. Features were promised to be in the game that were removed during development, or maybe were never actually there in the traditional sense. 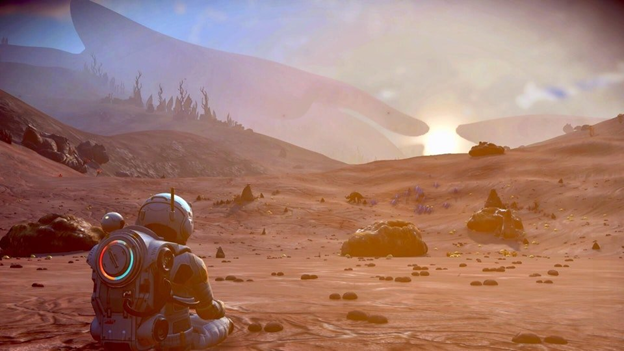 Sean Murray, the game’s creative director and public face, could have been speaking more abstractly about what he felt and imagined while playing rather than what was actually present in game. He was, perhaps, equal parts over-promising and being honest about how and what he played, because the game occupied equal space in his experience and in his imagination. For some, this interpretation may be too far-fetched or too convenient of an excuse for whatever we projected on NO MAN’S SKY before it released. Those projections are what inflated the game in our minds, as well as what deflated it after we finally got our hands on the controller. But believing this basic idea, that curiosity and roleplay are central to the NO MAN’S SKY experience, sets the features added in NEXT into clear relief. One of NEXT’s more ancillary features—an optional third-person camera—left some of the biggest impressions on me. A sense of place and the ability to see yourself embodied are a boon to a player’s ability to roleplay as well. While first-person gameplay offers an easier “in” to imagining yourself as a character (“those floating hands could be mine”), the ability to customize a character and see it embodied in the world attacks the problem from a different angle. If you can choose how you look and see it compared to other players (another instance of the multiplayer impacting play in an unforeseen way), you’re able to feel new ownership over what your avatar does. In this way, the update’s improved visuals and third-person camera not only help to convey a new sense of place and scale, but also further the core method of play in the game. When you stand next to a strange bird creature and see how much larger it is than you, it becomes easy to appreciate the amount of space both you and it occupy. The same goes for playing with others. You can appreciate each other’s cosmetics, how you’ve chosen to masquerade as the miniature Gek or the war-minded Vykeen. Cloud patterns hint at coming storms, hills and mountains in the distance draw just a bit further and render just a bit clearer making them that much more tantalizing to reach and that much more solid. If there’s any problem with this third-person camera and customization options as they exist now, it’s that they’re not varied enough, something that seems easily rectified and potentially monetized. Multiplayer, as NEXT’s vaunted, pervasive addition, may be the least interesting. Obviously difficult to implement into a game that was essentially a solo experience for years, it’s by no means perfect and certainly not what many fans imagined it would be (NO MAN’S SKY calls to mind MMOs, not four player couch co-op classics). My multiplayer experiences were decidedly peaceful, with other players entering my session, scanning an object or mining some materials, and then going on their happy way. Certain missions are designed to be completed with a group, and presumably as the game receives continuing support from its creators, those possibilities will be further explored. But as it stands, multiplayer seems to exist as a nice surprise or a simple way to show a friend the kinds of stories you’ve been telling through your play. That “surprise” idea is the most important. The possibility that anyone could jump into your game and suddenly make it feel that much more alive. Before this addition, the main exposure to other players was through the names of other planets and creatures that players may have discovered before you and a large online community created by fans of the game. Personally, I don’t feel like multiplayer is necessary to appreciate the game, but it is an interesting wrinkle that can make play feel more expansive. In many ways multiplayer calls to mind another long-suffering service game: DESTINY, and more egregiously, DESTINY 2. 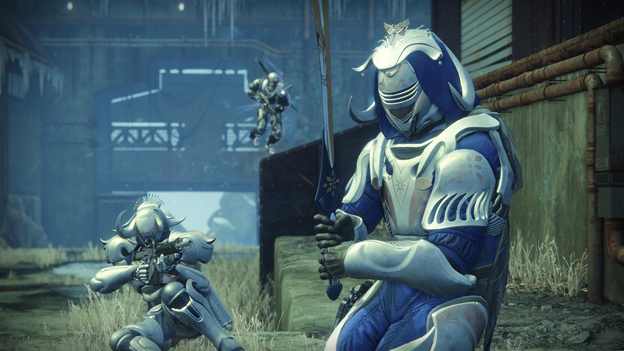 The early pitch for DESTINY was that every valuable item in the game could have a story behind it. Because of the drop-in, drop-out nature of the cooperative multiplayer, you might have a story of how a friend saved you from a giant alien, leaving behind valuable loot for the both of you, or how you both met up to complete a quest together, riding Sparrows and utilizing a unique combination of your super abilities to take down waves of robots. This type of gameplay never really materialized in DESTINY or its sequel. Sure, playing with your friends is fun (and frequently necessary), but because of the loot system and the actual small amount of quests and locations, the stories become repetitive. The procedural generation of NO MAN’S SKY could be the remedy to that problem. The randomness that comes with being able to jump into a stranger’s game is exciting, not knowing if you can reliably do that at all is much less so. Space Magic Sword Knight, my old foe, we meet again! All told, NO MAN’S SKY NEXT is the same game in spirit as it was when it released. Its methods have changed and its offering of activities has widened, but it’s still more concerned with conjuring place and mood than assigning them specific functions; more interested in “Where” and “How” than “Who” and “What.” NEXT is marked as a new phase for the game and, in some sense, the complete thought of what it should have been at launch. Even so, those who were ideologically repulsed to begin with may still run into the same problems this time as well. NEXT has smoothed out its central loops, but many aspects of the game remain obtuse or unwritten. This rejection of rigidity can be alienating, but in it also lies the thrill of procedural generation and the attractiveness of space. There is much to see and do, some of it familiar and some of it an enigma, but ultimately it is your interest and goals that you bring with you that will shape your enjoyment. NEXT does not make NO MAN’S SKY a game for everyone, nor the “forever-game” as many long assumed it could be. But it makes it, more than ever, a game worth trying and a game worth appreciating, because once it gets its hooks in you, whether for its grind-y systems or its lonely and beautiful vistas, you’ll find it hard to not want to tell your own kind of story with it, eggs or not.